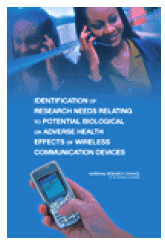 The National Academies will be releasing a report, Identification of Research Needs Relating to Potential Biological or Adverse Health Effects of Wireless Communication, based on its study sponsored by the FDA detailing the needs involved with investigating the health effects of RF exposure. The National Academies comprise the National Academy of Sciences, National Academy of Engineering, Institute of Medicine, and National Research Council. You can download the prepublication PDF at the link above.